life begins at conception and ends at natural death, will succeed. 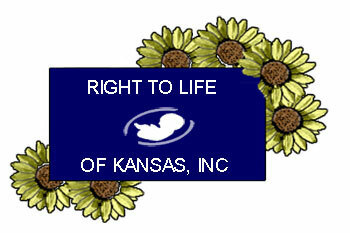 Information is copyright protected by Right To Life of Kansas, Inc. Mention of a person or group or a person's or group's publication does not constitute an endorsement of all the work, publications and/or information of such person or group. Unless otherwise noted, pictures are for illustrative purposes only. We believe that each person was created in the image of God, each with a divine purpose. (1) Abortion would be re-criminalized if the courts were to recognize the pre-born human being's full status as a human person. States that acquiesce in paying for abortion in order to obtain federal dollars do not themselves recognize the humanity of the pre-born, and their acquiescence provides the courts with another reason to affirm Roe v. Wade.